Killing odor and removing VOCs isn’t easy. The list of filters, gadgets, and “technology” in each product easily dazzles and confuses shoppers – sometimes intentionally. However, some of these confusing terms are really, really important. One of them, and perhaps one of the most difficult to truly understand is activated carbon (and charcoal). Which is sad because it’s the second most important component in effective air purification. 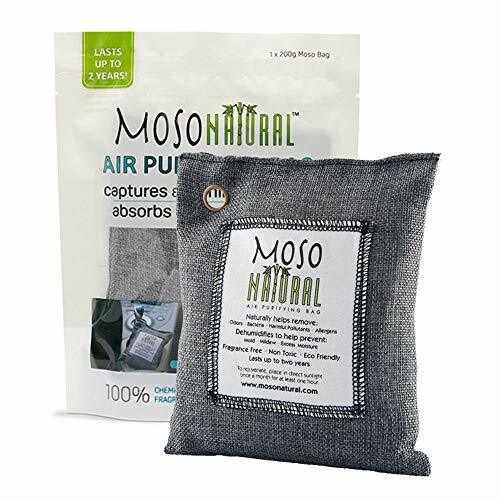 So to clear the air we decided to take a look at bamboo charcoal air purifier and purifiers with activated carbon filters. How do bamboo air purifiers work and why are they so important? We’ll cover that first. Then a bit farther down the page we’ll discuss activated carbon (and how it improves your air quality). And, finally… at the end we’ll recommend some plugin air purifiers with activated carbon filters. By the time you finish you’ll be a pro at eliminating odor and keeping VOCs unter control. Well, it’s a bag filled with bamboo charcoal. And that’s good because there aren’t many substances that beat out charcoal when it comes to soaking up odor, VOCs, etc. Why? Because charcoal, activated carbon, and the like are ultra porous. Just a single gram of activated carbon has an equivalent of 32,000 square feet of surface area ready for gas adsorption. Bamboo charcoal typically contains about 600 square meters per gram. (Most bags contain between 200 and 1000 grams of charcoal). So imagine a very small sponge like structure where even a small cube would contain millions of pores that are awesome at trapping stink (and some chemicals/gases). So, while these bags may look small they are pretty powerful. Even a fairly small bag will contain an equivalent surface are that could cover acres of land. And, they work… check out the reviews in the link below if you need more proof. The scientific and environmentally friendly reason is that they sequester carbon from the atmosphere efficiently. In fact, according to Guinness (no, not the beer), the fastest growing plant on earth is a type of bamboo. It grows about 35 inches in a 24 hour period. Now that isn’t the the case with all bamboo, most grow to full size in under five year. But, compared to hardwood used to create other charcoal products may take decades to reach adulthood. It’s pretty clear that you can’t beat bamboo when it comes to making activated charcoal/carbon. Now there is another very sustainable option that comes in at a distant second… and that’s coconut husks. They’re a byproduct of harvesting coconuts as a food product. But, per acre, they can’t match bamboo if the end goal is to produce a lot of carbon. Like Mr. Ronco used to say in his infomercials… set it and forget it. However, when it comes to these bags “set it” means set it in a drawer, cabinet, boot, etc. And, since they are passive, and require no electricity you can basically forget them until it’s time for a new one. 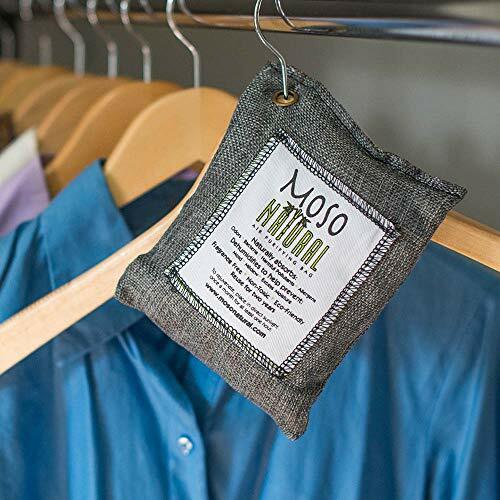 Where do we stash our bamboo charcoal bags? We always have on in the car, in the recycle/trash cabinet, and in the the laundry room. We also toss them in a stinky locker, drawer, bin, or shoe when needed. They do work best in fairly small spaces since they don’t circulate air (we’ll cover that later). But, when it comes to ease of use… they cannot be beat. Activated carbon, or activated charcoal, is a processed product made from a variety of organic materials. Any organic material with lots of carbon can be turned into activated carbon, typically through the same process that makes charcoal. However, activated carbon’s high density of microscopic pores sets it apart from other forms of charcoal. Each pore increases surface area. A product with the concentration of pores found in activated carbon can pack a lot of potential filtration into a relatively small space. In order to boost efficiency, many activated carbon filters come with additional chemicals that attract a wider range of particles. Activated carbon, through the process of adsorption, traps particles that other filters cannot. When these other materials come into contact with activated carbon, they trigger a chemical reaction that causes most particles to stick to the carbon’s surface area. The extra surface area of activated carbon allows it to function at a higher capacity for a longer period of time than basic carbon filters. It’s truly amazing how much odor is adsorbed by a fairly small amount of material. Activated carbon is used in everything from sewage treatment to gas masks. It even has a history of treating poisons. You can think of this material as a super sponge. Of course, it’s activated carbon’s power to filter gasses that make it such an effective air purifier filter. A gas typically carries the worst of indoor odors. While HEPA filters strain for particles alone, activated carbon filters can remove smelly and potentially harmful fumes. A good activated carbon filter also increases the lifetime of your air purifier, which is a serious investment worth protecting. Most carbon filters are pretty small. That doesn’t mean, however, that they’re inefficient. Since activated carbon is a more powerful material than most air purifier filters contain, they only need a small space in order to function. The best filters have lots of activated carbon in small particles, which maximizes the filter’s potential. Content matters far more than the actual size of the filter. Unfortunately, it’s almost impossible to tell how much carbon is in a filter, or how finely it’s processed. The best clues to the activated carbon’s condition come from previous users. The best way to understand how activated carbon filters work is to see the role they play in actual products. Below are some of the top rated air purifiers that rely heavily on their activated carbon filters. We’ve covered everything from basic specifications to customer sentiment, but if you’re in a rush, you can skim the pros and cons lists after every entry. This product includes a number of useful, cutting edge features, including WiFi control via smart phone. The true value, however, is still in the filter. It’s simple and straightforward. A single stage removes the bulk of particles from you air. The activated carbon filter is a replaceable option designed to fight odors. It’s effective for spaces up to 279 square feet and includes Energy Star certification. Many customers who chose this product enjoyed a new child lock feature, which helps families with small children. It’s a favorite of asthma and allergy sufferers, too. It runs quietly enough to not disturb sleeping users, and many previous buyers kept theirs in their bedrooms. Other users enjoyed the fact that this entire product is made from recyclable materials. This product is highly customizable. New buyers can choose between a set of filters to find the best option for their homes. The product comes with an allergy filter as the default, but smog and baby filters are also available. The P400 features paired HEPA and activated carbon filtration options. Five fan speeds allow for a perfect balance between energy consumption and air quality. Designers made this product to blend into the background, and it works with the push of a single button. Since it can handle air in spaces up to 600 square feet, it’s perfect for living rooms and small apartments with open floor plans. A five year warranty protects buyers, which is a great indicator of the product’s quality. Previous buyers found this product to be effective and easy on the eyes. It fit well in their homes and made a noticeable difference in air quality. A few new users had questions about the product’s operation, and they received great customer service. According to feedback, it runs quietly, and many previous buyers use this purifier at night. This small purifier is great for desks and bedside tables. It uses a smart sensor to automatically adjust between two available fan speeds. This model features five stages of filtration. A pre-filter removes the largest irritants. A true HEPA filter and an activated carbon filter remove odors and particles. After these two primary filters, a nano-mineral crystal filter sifts the air, and a medical grade ionizer catches anything the previous filters miss. The MM108 handles air in 160 square foot space, so it’s best for home offices, nurseries, or other closed rooms. Customers seem thrilled with this product. It made a noticeable difference in upper respiratory conditions like asthma within two or three days. Users found the controls were easy to use, and the chief complaint was that the display lights were too bright at night. The auto settings worked as expected and saved energy, too. By utilizing three different filters, this product targets different contaminants in your air. The HEPA filter handles tiny particles, the UV-C filter handles living microorganisms, and the activated carbon filter removes gases. A pre-filter protects all three from the biggest particles. 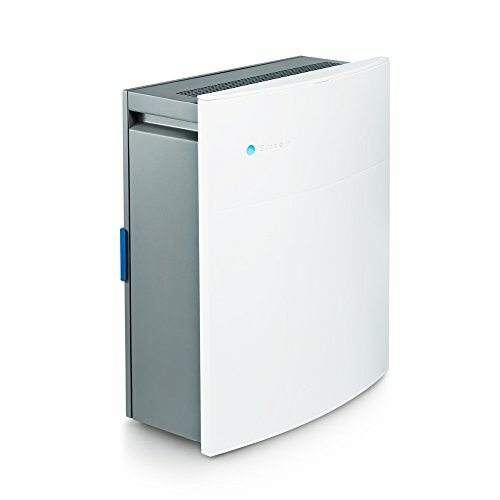 The purifier comes with three speeds to suit different times of day and air conditions. The slim design features a magnetic cover for easy cleaning and filter replacement. Since it’s only effective for approximately 350 square feet, this unit is best for small bedrooms and offices. Previous buyers found this product did a particularly good job removing smoke and gas from their air. The most common complaint involved operating noise. It may be louder than expected, and probably isn’t suited for night use in a bedroom. The other major concern involved replacement filters. While most customers enjoyed their air purifier’s performance for the first few months, they struggled to find replacement filters that fit into the unit once the originals wore out. Activated carbon is an essential part of any top performing air purifier. That said, your purifier needs more than a good activated carbon filter to thoroughly clean your air. The products we reviewed relied a lot on their carbon filters, often pairing them with HEPA technology, but the best options will almost always feature additional stages of filtration. So, which of these is the best? The BlueAir Classic sits at the bottom of the list. Although activated carbon is important for its touted performance standards, the actual filter costs extra. This is an unnecessary burden on the buyer. Although the Avalon has a lot of great praise from previous users, the fact that replacement filters are almost impossible to find limits the lifespan of the product. You will need to replace the HEPA filter eventually; no matter how good the pre-filter is. The Biota and Boneco tie for first. They address very different needs, so it’s difficult to properly compare them. 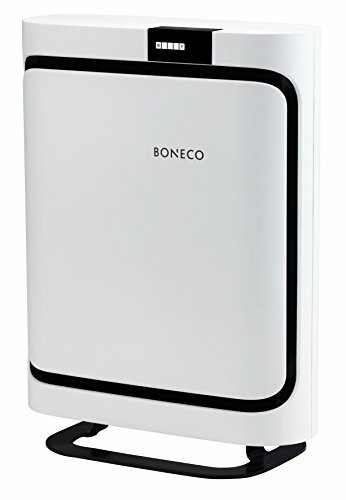 Users looking to filter large spaces will benefit most from the Boneco, which managed up to 600 square feet. Those looking for a smaller product to clean the air around their work desk would get the most use out of the Biota. Even though Boneco doesn’t use many layers of filtration, it packs lots of different materials into a single filter to conserve space. Either purifier is a good choice, and there’s nothing wrong with running both. Bottom line if you want to clean the air carbon is a must.